During the summer the bees collect nectar, turning it into honey. They store the honey in the beeswax comb, in the famous hexagonal shape cells. The honey is the bees store of food for the winter. They can bring in huge amounts of nectar, which they change into honey, allowing the excess to be removed by the beekeeper. The nectar is placed in the hexagonal cells and left until the water content is reduced by the heat of the hive. Once the water content is correct (around 18%) the bees will place a beeswax capping across the mouth of the cell preserving it's content. Once the majority of the cells are capped the fun begins. As to be expected, all the items used during the extraction that have contact with the honey have to be food grade, so this means stainless steel and food grade plastic. As previously mentioned, the honeycomb is held in a frame which enables the whole frame of honeycomb to be removed from the hive. To the beekeeper, that means two sides of frame to extract the honey from. So how is the honey removed from the hive? 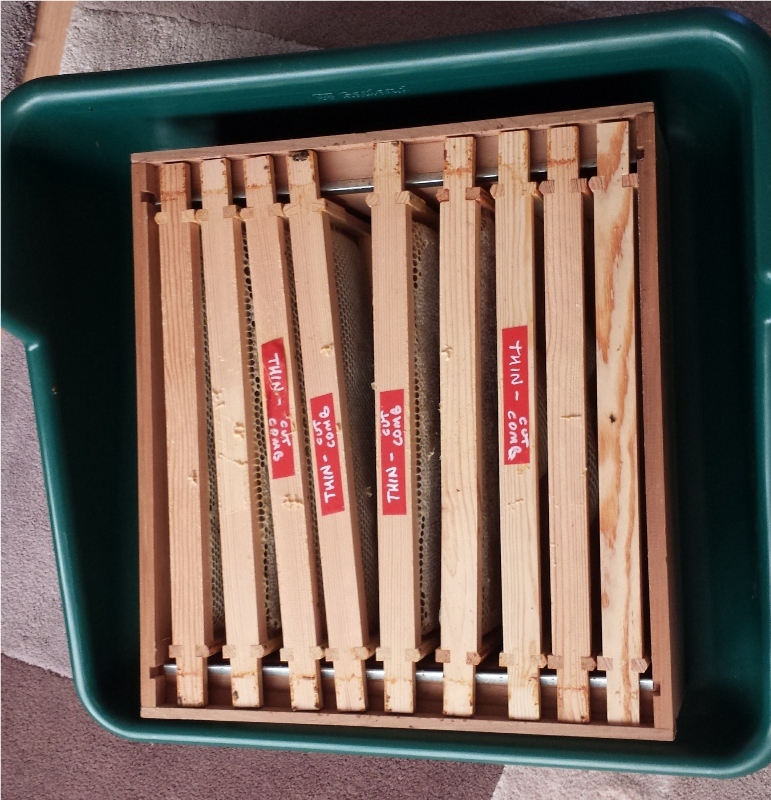 Well, the bees are protective of their honey, and so a 'one way valve' is placed under the frames, so that the bees cannot return to the frames once they have left. 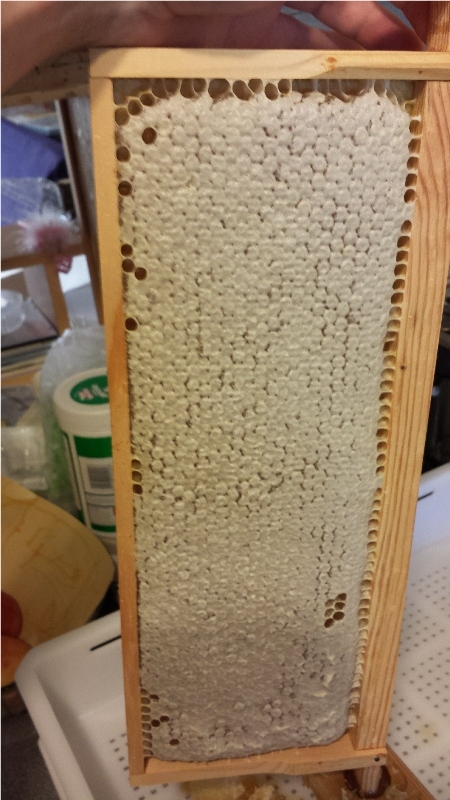 This 'valve' is left for 24hr, and then the frames are removed from the hive, the odd bee left is carefully brushed off. The frames are placed on the uncapping tray which can be seen in the picture. Each frame then has the capping's (covering each of the cells) removed by using a knife to cut them off. 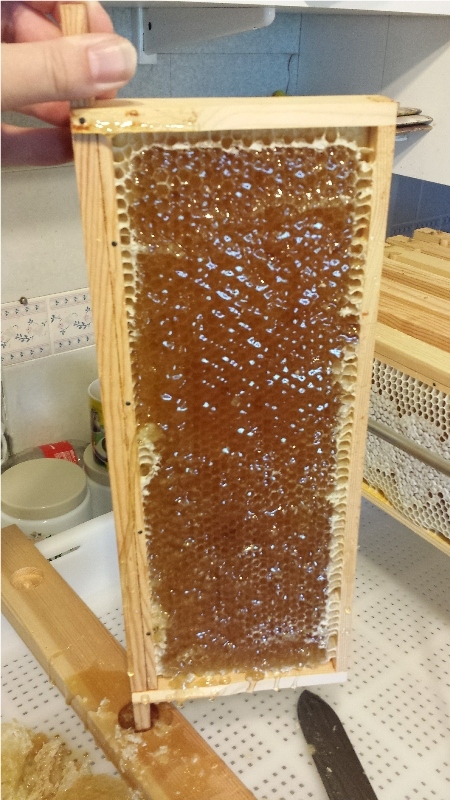 The capping's fall into the tray, and any honey drips into the lower tray. The wax capping's are kept as they are nearly pure white in colour-excellent for candles. The two photos show the before and after the frame is uncapped. Once both sides of the frame have been uncapped, four frames at a times are placed into the honey extractor. A handle is turned that simply rotates the frames at speed, spinning out the honey which collects in the bottom of the extractor. The extractor is a 'tangential extractor' this means that one side of the frame is extracted at a time, the frame is removed/turned and replaced allowing the other side to be extracted. 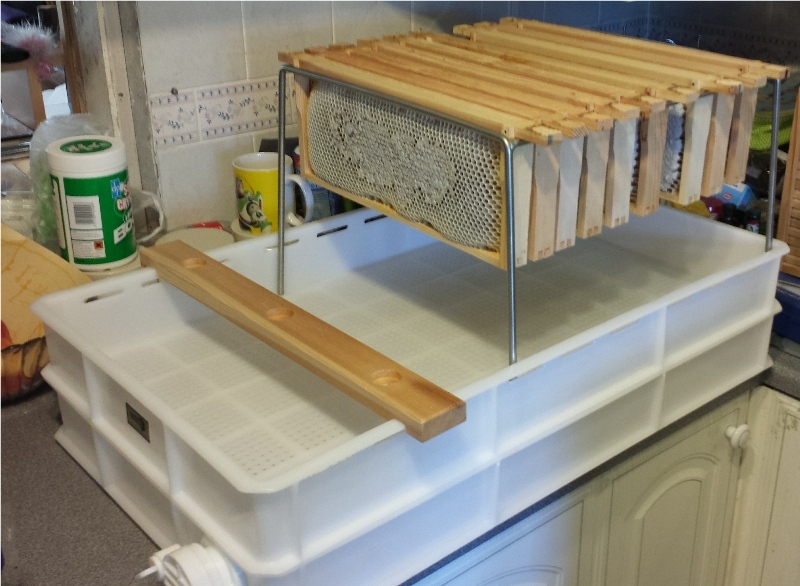 For smaller numbers of hive this type of extractor is cheaper, although slightly more labour intensive due to the extra turning of the frame. 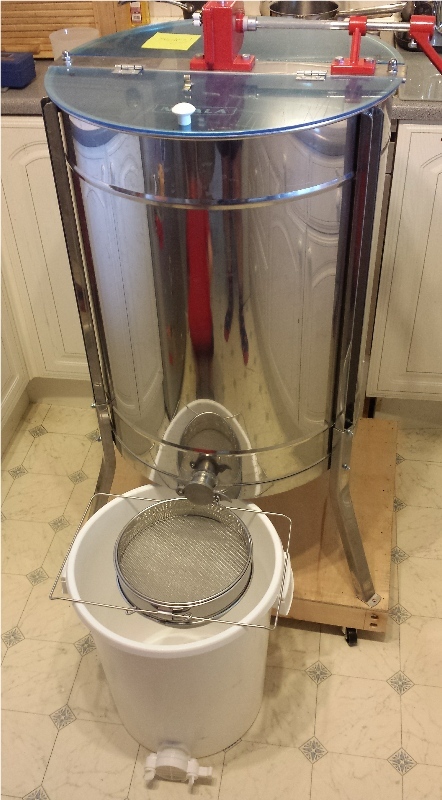 The photo also shows the two stage filter and the honey bucket awaiting for the honey.br>The extractor is sitting on a custom made wooden platform with four wheels mounted on the underside. This allows the extractor to move/shake around a little when spinning, the movement is due to the extractor not being balanced, a bit like a washing machine spinning full of washing ! 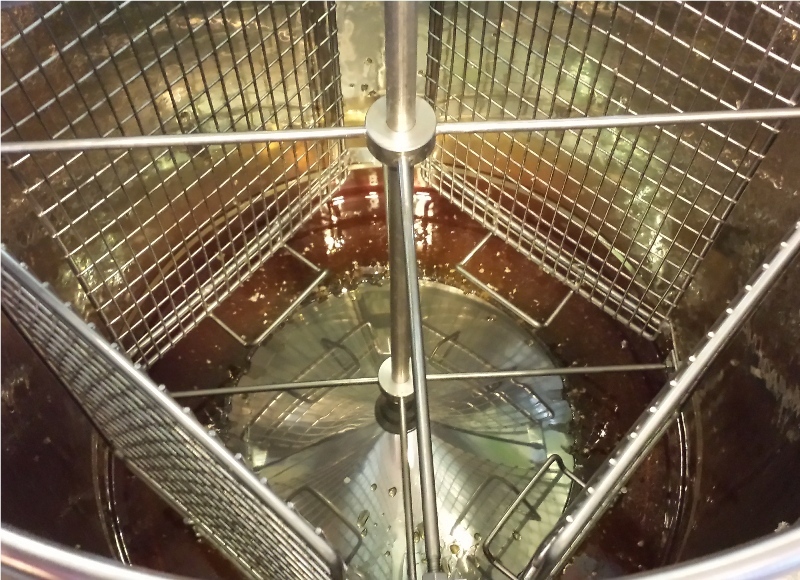 This photo shows the honey coming out of the extractor onto the first filter. Immediately below is a finer filter. Once the honey has been filtered, it is collected in the bucket below. For those interested, the hole size for the filters for the coarse and fine filter are 1.5 mm and 0.5 mm respectively. The size of the filters allow the pollen to remain in the honey. 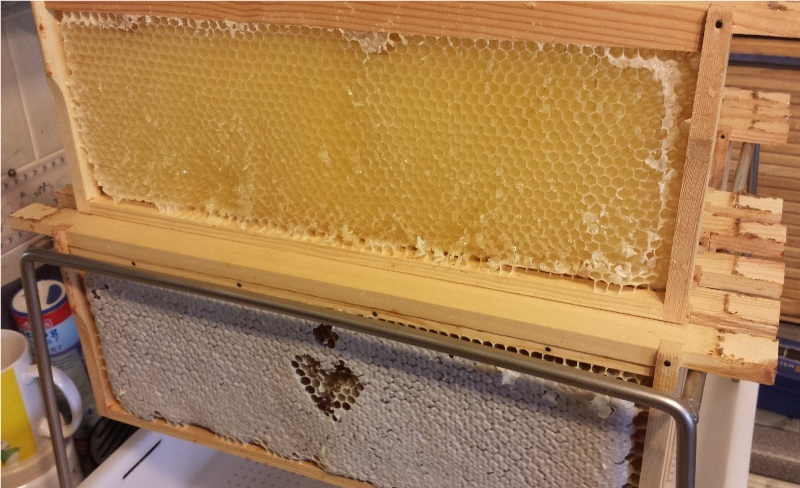 This picture shows the difference in the extracted frame (at the top) compared to the frame as taken from the hive. A small sample is also tested to ensure that the water content of the honey is within the limits to allow it to be sold as 'honey'. 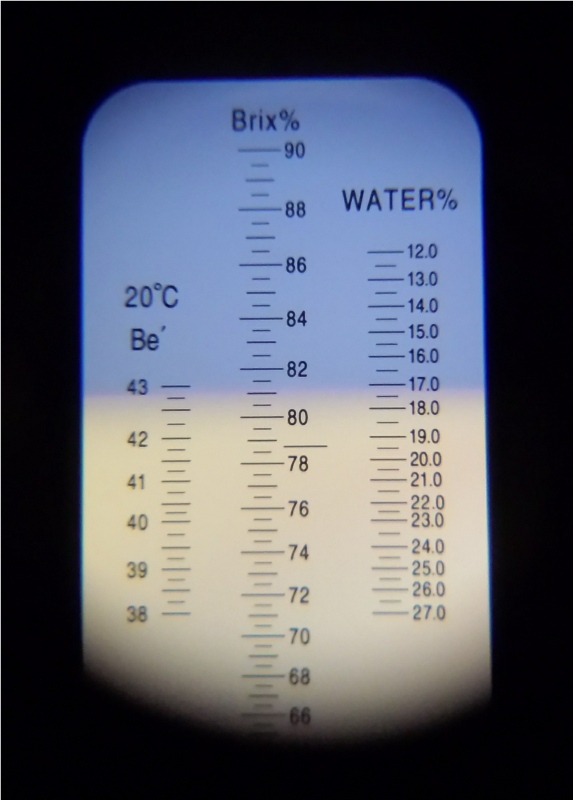 A water content of under 20% is required, you can see in the right hand side of the photo that the honey has 17% water content. 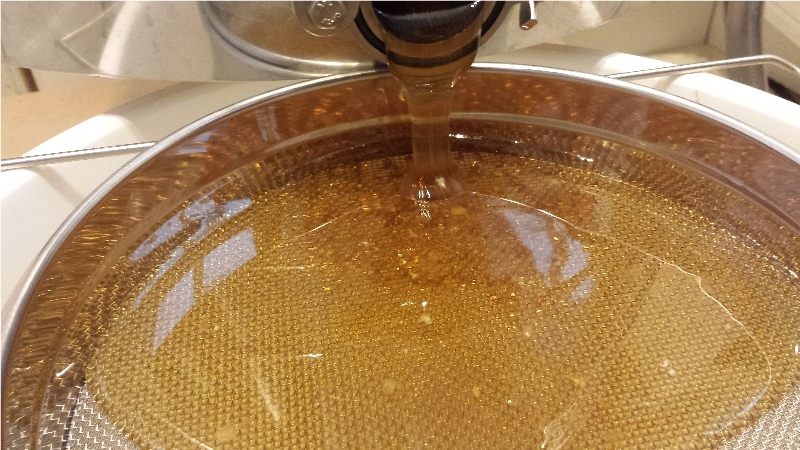 Once filtered, the honey is allowed to settle for a few days allowing the small air bubbles in the honey to rise to the top, without this settling, the honey would be cloudy. 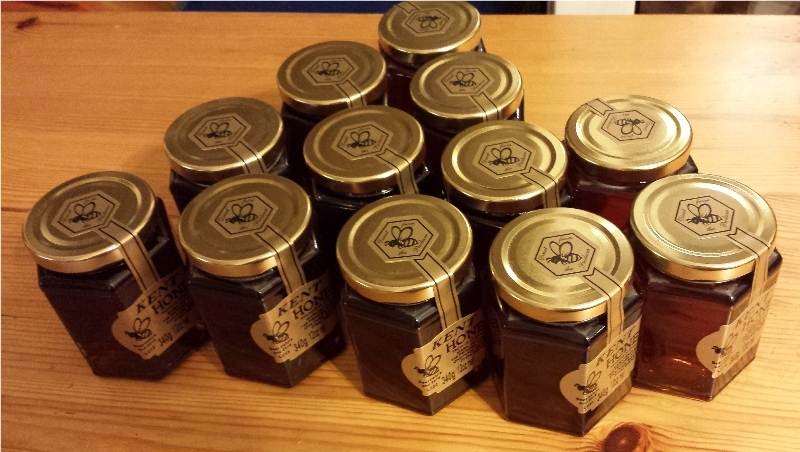 The honey can then be poured in to jars and labelled, if it last that long before being eaten! The picture show my jars after being filled with honey awaiting for their labels. I plan to take a sample of the honey and looked at the pollen under the microscope and hopefully identify the main type of plants that the bees have been foraging on to produce the honey. My honey can be purchased directly by following this link. Another way of 'removing' the honey is to produce 'cut comb' honey. This is when the whole honeycomb is cut out of the frame in small blocks and packaged complete with the beeswax. The beeswax is of course edible and this 'cut comb' honey is considered a delicacy.